QUANTUM AUDIO QRM4000. MONOBLOCK AMPLIFIER WITH. •X-Over Slop:12 dB. Class D Circuitry. 4000 WATT CLASS D. •1 Ohm Mono Capability. •1 x 4000 Watts @ 1 Ohm. •Input Sensitivity: 285Mv - 6V. The Quantum Audio QA3000D replaces the older QCA3000D. The new look of the amplifier is much nicer, and it will match the style of any install. 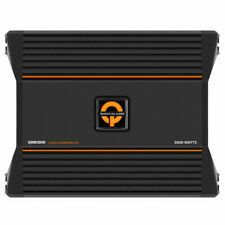 The QA3000D is a 3,000 watt mono-block car amplifier. QUANTUM AUDIO QRM3000. MONOBLOCK AMPLIFIER WITH. •X-Over Slop:12 dB. Class D Circuitry. 3000 WATT CLASS D. •1 Ohm Mono Capability. •1 x 3000 Watts @ 1 Ohm. •Input Sensitivity: 285Mv - 6V. The Quantum Audio QA2000D replaces the older QCA2000D. The new look of the amplifier is much nicer, and it will match the style of any install. 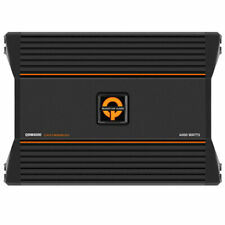 The QA2000D is a 2,000 watt mono-block car amplifier. QUANTUM AUDIO QZA4100D. MONOBLOCK CAR AMPLIFIER. Monoblock Amplifier / 4000 Watts. Class AB Circuitry. 4000 WATT AUDIOPHILE GRADE. WITH REMOTE BASS KNOB. 1 Ohm Load Mono Capability. Variable low pass x-over. QUANTUM AUDIO QZA4000D. 4000 WATT MONOBLOCK. Monoblock Amplifier / 4000 Watts. CLASS D POWER AMPLIFIER. WITH REMOTE BASS KNOB. Class AB Circuitry. 1 Ohm Load Mono Capability. Bass Boost @ 45Hz. QUANTUM AUDIO QZA3100D. MONOBLOCK CAR AMPLIFIER. Monoblock Amplifier / 3000 Watts. Class AB Circuitry. 3000 WATT AUDIOPHILE GRADE. WITH REMOTE BASS KNOB. 1 Ohm Load Mono Capability. Variable low pass x-over. QUANTUM AUDIO QB2000D. MONOBLOCK AMPLIFIER WITH. Beta Series 2 ohm mono Amplifier with class "AB" circuitry, rated at 14.4 volts. Buffered pre-amp input circuitry. 2000 WATT BETA SERIES. Continuously variable 12dB low pass-x-over. Box Previously Opened. Product - New Condition . Monoblock Amplifier / 5000 Watts. Class D Circuitry. Variable Hi-Pass X-over. • 1 x 5000 Watts @ 1 Ohm. Input Sensitivity: 285Mv – 6V. Audiophile Grade components. Q-Link Technology: Link 2 like amplifiers for double the power. Quantum Audio QB1500D 1-Channel Car Amp BASS Condition is Used. Shipped with USPS Priority Mail. QUANTUM AUDIO QB1500D. 1500 WATT MONOBLOCK AMPLIFIER. Buffered pre-amp input circuitry. INTERNAL CIRCUITRY: Class. Continuously Variable 12dB Low Pass X-over. Continuously Variable 12dB Bass boost @ 45Hz. Class AB Circuitry. Variable low pass x-over. Input Sensitivity: 285Mv – 6V. NEXT LEVEL AUDIO 1. Bass Remote Included. THD @ Rated Power: <0.5%. 1 x 400 Watts @ 4 Ohm Mono. Signal to Noise Ratio: >90dB.